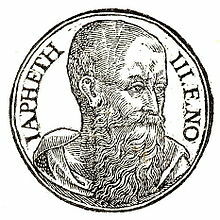 Japheth (Ebreu: יָפֶת/יֶפֶת‬, Modren Yepet/Yapet, Tiberian Yep̄eṯ/Yāp̄eṯ; Greek: Ἰάφεθ Iapheth; Laitin: Iafeth, Iapheth, Iaphethus, Iapetus), is ane o the three sons o Noah in the Beuk o Genesis, whaur he plays a role in the story o Noah's drunkenness an the curse o Ham, an subsequently in the Table o Naitions as the auncestor o the fowks o the Aegean, Anatolie, an emsewhaur. ↑ Hunt 1990, p. 430. Hunt, Harry B., Jr. (1990). "Japheth". In Mills, Watson E.; Bullard, Roger Aubrey. Mercer Dictionary of the Bible. Mercer University Press. ISBN 9780865543737. This page wis last eeditit on 3 November 2018, at 05:16.